We had a super day in Bristol yesterday. There we so many people interested in electric bikes we only had time to eat half our lunch! It was an early start to the day leaving at 4.00 am - at least we stopped for breakfast on the way. We arrived on site just before eight and got everything set up for the day. There were approximately twenty (I forgot to count) electric bike manufacturers with pop-up stands all set up in a long row. The riding area was paved and stretched along in front of the stands round the end of a water feature and then up and down slope in front of the town hall to a turning point and then back the same way. It was good to have a slope so test riders could see how easily our bikes cope with hills. Once the show started we were really busy. 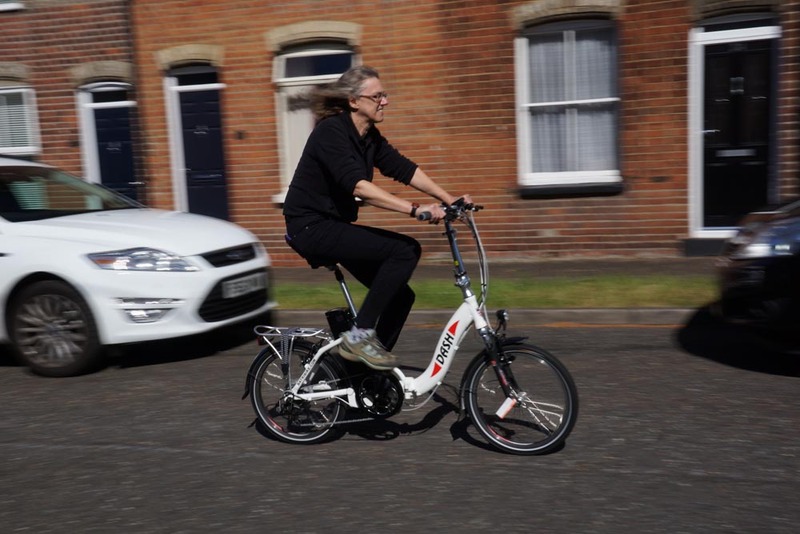 There were many visitors who hadn't tried an electric bike before and they were all pleasantly surprised with the assistance and how easily it could be adjusted. Once again there was lots of interest in the Dash and several people who wanted to talk about "The Apprentice" experience. The Dash on The Apprentice has created more press photos! I have just arrived back from a photo shoot with the local paper. They were interested in the Dash and my busy day on Wednesday. The photographer wanted to get some shots of me riding the bike and chose a suitable location. Whilst I hung on to his cameras he had great fun riding up and down on the Dash. "What brilliant fun! I love it" he said. So then down to business on the photo shoot. I had to ride up and down the road, smiling (which wasn't difficult as the aforementioned Dash is fun to ride) and avoiding cars, lorries and stray pedestrians. It's all in a days work at the moment, our appearance on The Apprentice has certainly created a lot of interest in Batribike and electric bikes in general. It was very exciting to see myself and the Batribike Dash on prime time BBC TV yesterday evening. It has also been brilliant to hear from lots of people today who saw the programme and really enjoyed it. The whole process started way back in the mists of time …. The Motorhome and Caravan Show at the NEC is in October, so filming was some time ago. I spent a day filming with the teams in Birmingham where they were given the opportunity to choose from an array of different accessories. Once they had chosen the products they liked they could then “interview” the owners of those specific products. Both teams loved the idea of an electric bike and the Dash in particular, so both teams interviewed me. One friend today has asked me “was it scripted or were you given a brief?” The answer to that is No! I was allowed to answer questions in the way that I wanted, just like any business meeting. After the interview with the two teams I was asked to choose which team I would like to sell the Dash bike. I chose team Evolve because they clearly had so much more enthusiasm for the bike. The next day the teams set up pop-up stands at the show to sell, sell, sell! I was back on our stand so we didn’t get any chance to see how they were doing all day. Just this Monday Ralph and I went to London to see a preview of the show. This was the first time we had seen it or had any idea how it would turn out. We were delighted to see that the team that I had chosen – Evolve, were the ones that won the task. Today the response to the show has been tremendous with friends and acquaintances across the industry emailing congratulations. Tomorrow I am off on a photo shoot with the local paper too! I am making the most of my short lived fame, next week it will back to business as usual. See the website news item for more about the Batribike Dash on The Apprentice. Today I have been to London to join the All Party Parliamentary Cycle Ride which marks the start of Bike Week. I was there as part of a group representing BEBA the British Electric Bicycle Association. It’s all about promoting cycling, and in our case promoting electric cycling. The event started at the Embassy of the Kingdom of the Netherlands situated next to Hyde Park. I had to be there at 8.00 for breakfast and talks and then the ride was to start at 9.00. I decided that the best plan was to drive up from Essex in the car with the conveniently folded Dash in the boot, park outside the congestion charging zone and ride in. The 44 mile journey was supposed to take an hour and a half according to the AA route planner, but with morning traffic to take into account I decided to give myself two hours, which was just as well, as I arrived at 8.00. The journey was pretty uneventful apart from passing some high spirited cavalry horses in the last mile. The Embassy was very welcoming and all attendees were presented with a bright orange rucksack which proclaimed “Love Cycling, Go Dutch”. After the speeches we headed out into Hyde Park to group up. The event was headed by a rider from the MET Police Cycle Team. He told us that we must obey the rules of the road and stop at red traffic lights, which is how it should be. I think they had a tough time keeping such a big group marshalled but they worked well as a team and the ride went well. At one point a Range Rover driver was getting a bit impatient and trying to cut into the group at some traffic lights, but the policeman just had to point to his shoulder badge and the driver thought better of it. There were lots of different people on the ride including many from the Dutch Embassy, three of them were riding wooden framed bikes. The Ambassador, Ms Laetitia van den Assum also joined the ride. At one point she pulled alongside me and asked about my bike. I explained that it was an electric bike and that you could select different levels of assistance depending upon the terrain. She told me that electric bikes were very popular in Holland. It was a superb ride taking in so many iconic sights of the City. We rode down Constitution Hill, past Buckingham Palace and along Birdcage Walk to the Palace of Westminster where we congregated on the green opposite Black Rods Garden. After a photo call everyone dispersed. The electric bikes intrigued Rags Martel, a reporter from the ITV news who had been doing a piece on the event. When he had finished the story on the ride he hopped on the Dash had had a quick ride around the green. When he returned he had that “electric bike grin” on his face. It was then time to ride back to the car. Going back up Birdcage Walk a troop of mounted Horseguards were coming the other way in the sunshine, and then when I got to Buckingham Palace they were changing the guard and the band was about to play – I couldn’t have timed it better. Back to the car and I set the TomTom for home. It took me on a magical mystery tour avoiding the congestion zone again. I drove a long the Thames Embankment, more iconic views. I could see Battersea Power Station’s unique shape, then across Vauxhall Bridge. Wiggling my way across the south side of the river I then had to cross back via Tower Bridge with an excellent view of the Tower of London. It doesn’t matter how many times I visit I still get that excited feeling when I see all these great landmarks. From there it was a short hop to the Elephant and Castle with a view of the Shard and via the Limehouse Tunnel to Docklands where I could see the bright yellow gantry sticking up from the O2. What an excellent day out! I had several errands to run today which were easy to do by bike. I decided to take the Granite XL for a change. I usually ride the Diamond, the upright riding and dutch style handlebars give such a lovely relaxed riding position. All this is quite surprising because I always used to ride a cross-bar bike! The Granite XL performed perfectly, the larger frame and 700C wheel suit my leg length (being almost all leg I am actually short when I sit down!). The pedal assistance made the inclines easy and the perfect sunny weather made the errands seem like a leisure ride. Perhaps next time I will take the Granite XL again.